* open-iscsi users might face hangs during OS shutdown. * hangs can be caused by manual iscsi configuration/setup. * hangs can also be caused by bad systemd unit ordering. disconnected, then the hang will happen. * check comment #89 for the fix decision. the transport layer, before proper iscsi logout was done. would not cause any harm to data. I have 4 servers running the latest 16.04 updates from the development branch (as of right now). Each server is connected to NetApp storage using iscsi software initiator. There are a total of 56 volumes spread across two NetApp arrays. Each volume has 4 paths available to it which are being managed by device mapper. While logged into the iscsi sessions all I have to do is reboot the server and I get a hang. "systemd-shutdown: Failed to finalize DM devices, ignoring"
"connection1:0: ping timeout of 5 secs expired, recv timeout 5, last rx 4311815***, last ping 43118164**, now 4311817***"
"connection2:0: ping timeout of 5 secs expired, recv timeout 5, last rx 4311815***, last ping 43118164**, now 4311817***"
"connection3:0: ping timeout of 5 secs expired, recv timeout 5, last rx 4311815***, last ping 43118164**, now 4311817***"
"connection4:0: ping timeout of 5 secs expired, recv timeout 5, last rx 4311815***, last ping 43118164**, now 4311817***"
"connection5:0: ping timeout of 5 secs expired, recv timeout 5, last rx 4311815***, last ping 43118164**, now 4311817***"
"connection6:0: ping timeout of 5 secs expired, recv timeout 5, last rx 4311815***, last ping 43118164**, now 4311817***"
"connection7:0: ping timeout of 5 secs expired, recv timeout 5, last rx 4311815***, last ping 43118164**, now 4311817***"
"connection8:0: ping timeout of 5 secs expired, recv timeout 5, last rx 4311815***, last ping 43118164**, now 4311817***"
NOTE: the actual values of the *'s differ for each line above. This seems like a bug somewhere but I am unaware of any additional logging that I could turn on to pinpoint the problem. Note I also have similar setups that are not doing iscsi and they don't have this problem. This is being tracked in NetApp bug tracker CQ number 860251. We are wondering if this could be some kind of shutdown ordering problem. Like the network devices have already disappeared and then iscsi tries to perform some operation (hence the ping timeouts). To change the source package that this bug is filed about visit https://bugs.launchpad.net/ubuntu/+bug/1569925/+editstatus and add the package name in the text box next to the word Package. My first suspicion is that the interface that the iscsi device is on lives in /etc/network/interfaces (or interfaces.d/*) somewhere and thus is being shut down by networking.service. Ordinarily this network interface is being set up in initramfs by open-iscsi and should not otherwise be configured/touched by the OS (i. e. not by ifupdown, NetworkManager, or networkd). - Which network interface is the iscsi device on, and how did you configure this? It would also be useful to attach a complete shutdown log. Do a reboot and attach /var/log/syslog, that should have sufficient data for the network interface shutdowns (it won't cover the open-iscsi error though as that happens too late, but we have that part in the screenshot). In the above, the two NICs used for iSCSI traffic are the enp130s0 and the enp4s0f0. In case you were wondering I have another server running ipv4 and it also hangs. Do you have your root partition on iscsi, or just some auxiliary ones like /opt? If it's the root partition, then you can't put that on an interface which is "auto" in /etc/network/interfaces -- ifupdown will tear it down during shutdown and sever the connection, explaining the hang. In this case, open-iscsi's initramfs integration will already bring it up. (Hence my question how you set this up). Here is the requested syslog. Nothing for the system is on iscsi. They are just extra volumes that I use for generating block or filesystem IO to our storage. And again, how exactly did you set this up? Is this reproducible in a VM somehow? Can you please give me /etc/fstab and other files where you configured this? Here is the requested journal.txt file. I had a bit of difficulty after performing the requested operations, my server kept booting into the (initramfs) prompt. The journal log may contain more than one reboot attempt. This contains the configuration of my iscsi sessions. It is a tar of the entire /etc/iscsi folder, it should show what we've got going on. Looks like iscsi not always stopped before network interfaces are down. >Looks like iscsi not always stopped before network interfaces are down. Because it is not always reproduced, I guess this is dependency problem. I guess we need $remote_fs here? I definitely have remote filesystems mounted (using _netdev if that matters) when I experience this problem. I have finally been able to verify that this is reproducible with the released 16.04 from the ISO. What else can be provided here to move this bug along? I have the same problem with my multipath iscsi session. I just logged in without mounting the volumes. While rebooting I get always the message "systemd-shutdown: Failed to finalize DM devices, ignoring" but in most cases the server just ignores that an reboots. The iscsi multipath volumes are blacklisted in lvm config and are currently not mounted. rc_micha: Your volumes aren't mounted, but the iscsi sessions are logged in? If you log out of your iscsi sessions does it shutdown clean? Seeing what I believe is this bug on a 16.04 install that boots from iSCSI LUN. When I shut down, it goes just past shutting down the network interfaces, then slows down and starts throwing task blocked messages from the kernel. It eventually gets down to "Reached Target Shutdown" before getting completely stuck. I have to manually shut down or reboot the machine from that point. so iscsi can not logout. There is clearly something wrong here. FWIW This issue did not exist in 14.04. If this is still a problem, what do we do now? Do I just keep testing with new releases and file new bugs? For completeness, I upgraded to 16.04.1, the issue is still present. I upgraded to the latest xenial-updates packages as of 10/24/16 and the issue is still present. I then re-installed with 16.10 and the issue is still present. I guess I'll open a new bug for 16.10 and refer back to this one. Seeing a similar issue here with so called "diskless" clients. That is, all of their filesystems are network mounts including the root filesystem. These systems use iscsi targets for the root filesystem and during shutdown the network is turned off before the file I/O operations are completed which causes the system to hang with filesystem IO errors. I'm currently looking to see if there is some way to make systemd keep the network up no matter what, all the way until the machine physically reboots or shuts down (ie. disable the network shutdown completely). This worked in 14.04 and got broken in 16.04 apparently due to the switch to systemd as far as I can tell (great tool, isn't it?). Any idea on this one folks? So let's separate out two issues in this bug. @gimpeystrada, I believe your issue was always with iSCSI disks that were not in-use as the root/boot disk, correct? Looking at your fstab, I think also you don't have multipath over iSCSI, correct? For anyone else indicating this bug is also affecting them, if @gimpeystrada replies in the affirmative to the above (Not using iSCSI for root disk, not using multipath), then I would like to use separate bugs for those issues. They may all have the same root-cause, but it becomes rather noisy, otherwise. @gimpestrada, have you tried 16.10 or 17.04 to see if it has been fixed already? Just curious. iSCSI disks are not the root/boot disks. Multipath IS in use. Hence the /dev/mapper at the beginning of the disk names. @gimpeystrada: thank you for the prompt response! Err, right on multipath. Is it at all possible to test without multipath in use? To help narrow down if it's really in iSCSI or if it's in the multipath layer? Note additional bugs aren't required (I understand at some point this one may have expired, but we'll end up creating tasks here for all affected releases). 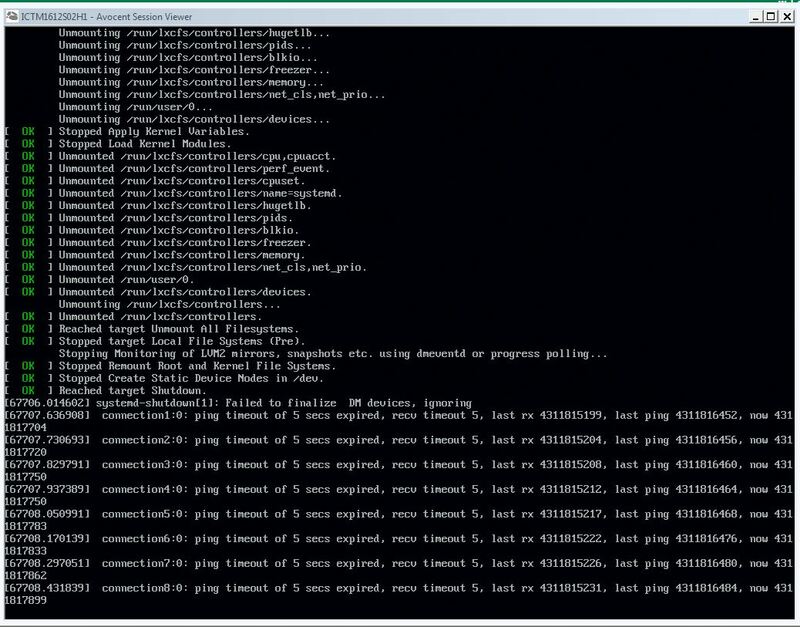 It is possible to test without multipath, this will take some time as I no longer have anything with 16.04 installed. For fun I may go ahead and try with 17.04 so we can figure out if it still exists then we'll kind of kill two birds with one stone. No problem -- also, you can just test in 16.10 without multipath. I can spend time reproducing it, etc. later to verify whatever fix we come up with is correct. Didn't take as long as I thought. Installed the most recent build of Zesty (zesty-server-amd64.iso	2017-02-22 06:54	676M). 1. Confirm the issue still exists. 2. Confirm that the issue is not caused by multipath (i.e. it still occurs during reboot when multipathing is disabled). Can confirm this issue as well. > Can confirm this issue as well. be an issue, but for non-root, I'm not sure why that's not working. Apr 26 08:52:13 ICTM1612S02H1 iscsiadm: :0113,3260] successful. Apr 26 08:52:13 ICTM1612S02H1 systemd: Failed to start Login to default iSCSI targets. Apr 26 08:52:13 ICTM1612S02H1 systemd: open-iscsi.service: Unit entered failed state. Apr 26 08:52:13 ICTM1612S02H1 systemd: open-iscsi.service: Failed with result 'exit-code'. My test configuration has long since been re-tasked. I will eventually be able to come back and test as you ask, but it may take a few weeks. If anyone else on the bug has their systems up and available, please test and reply. There was no systemd service order in play (in between open-iscsi, iscsid and networking / ifupdown scripts) and I was able to cause the same issue 100%, same messages, same symptoms. This tells us that, definitely turning down the network while still logged iscsi sessions is causing the hangs (check #3 for why). - this would cause the bug i'm mentioning: daemon dies, logout doesn't work. And, finally, the hang is because kernel is hanged during its shutdown logic. ALL CPUs were idling during the hang. CURRENT: PID: 0 TASK: ffffffff81e11500 COMMAND: "swapper/0"
CURRENT: PID: 0 TASK: ffff8801a6a20e00 COMMAND: "swapper/1"
CURRENT: PID: 0 TASK: ffff8801a6a21c00 COMMAND: "swapper/2"
CURRENT: PID: 0 TASK: ffff8801a6a22a00 COMMAND: "swapper/3"
NO task was scheduled to run.
""" ... This will immediately stop all iscsid operations and shutdown iscsid. It does not logout any sessions. Running this command is the same as doing "killall iscsid". Neither should normally be used, because if iscsid is doing error recovery or if there is an error while iscsid is not running, the system may not be able to recover. This command and iscsid's SIGTERM handling are experimental. """ Basically meaning you're not able to shutdown the daemon in a clean manner if you have connected sessions. And basically, checking the pastebin, you see the need for running iscsid daemon to logout through iscsiadm command. If umountiscsi.sh (it doesn't kill applications using a mount point) can't umount a mount point (from fstab generator or a mount unit) that is still being used, the logout-all.sh will fail for logging out the session of the disk being used. But this service unit would be considered stopped, allowing "iscsid.service" unit to also be shutdown (killing the iscsid daemon and leaving an opened iscsi session). This would be problematic for iscsi root disks AND for the kernel issue (comment #73), and this is being taken care by Francis Ginther (fginther) in the next iscsi SRU: https://pastebin.canonical.com/196463/ by creating an iscsi-cleanup.service that will run a script that logs out all remaining iscsi sessions (including /) right before kernel shutdown is called by systemd-shutdown like showed in comment #73. I pasted wrong pastebin URL. I'll describe the fix: its a service unit file that runs at the end of shutdown, right before it, re-using /run (tmpfs). Service has a preparation script that copies binaries from initrd image - so there is a minimum execution environment available - and runs the second script. Second script initializes iscsid daemon and waits in a loop for all the portals to be ONLINE and existing sessions to be LOGGED. After that it does the logout on all existing sessions (this case this would be leftovers from my previous comment AND / root disks). I tested this approach and it works good for iscsi root disks because there is a network interface that stays connected all the time. In the case of leftovers from previous unsuccessful umount attempts, the network.target would be already gone (with networkd / ifupdown interfaces already shutdown). IF I keep my interfaces configured, then this approach works for root disks AND for leftovers. For this approach to be successful for this case, this "cleanup" service would have to raise existing interfaces up again for the iscsid to login and logout to work (OR the kernel hang be resolved, then leftovers would be just left there, without logouts). Create a file: /lib/systemd/system-shutdown/debug.sh and place the contents in it. This workaround (based on some ideas from sil2100 and slangasek for iscsi / umount) is basically bringing the interfaces up and remounting / so it can finally cleanup everything. What is this script different then altering open-iscsi.service ? It runs at the very end of systemd shutdown and it is very unlikely that there are any services holding references to iscsi mounts, disallowing them to be logged out. Now I'll test Debian SID and check if this is found there, to open a bug in Debian project as well. Before moving on into open-iscsi services - to create a cleanup unit file for the open-iscsi package, like this workaround - i'll dig into the kernel issue. I'm afraid no fix will be as good as making sure kernel let the queued I/O cmd go. I have also to make sure this workaround is changed to allow root iscsi to be logged out. Even with the script a shutdown/reboot takes a very long time. Any expectations when a fix will be ready? I hit this all the time on 2 installed servers. Unfortunately the best way to make this not to happen is by fixing the kernel hang situation, when kernel calls sd_sync_cache() to every configured device before the shutdown. There is a single I/O cmd hanging in all scsi paths and the I/O error is never propagated to block layer (despite iscsi having proper I/O error settings). I'm finishing analysing some kernel dumps so I can finally understand what is happening in the transport layer (this happens with more recent kernels also). The workaround was to create a script that would restore the iscsi connection, wait for the login to happen again and the paths are back online, and cleanly logout, allowing the sd_sync_cache() operation to be finalized. You have to make sure open-iscsi and iscsid systemd units are started after the network is available and are stopped before they disappear. That might be your problem, if configuration above is correct. I followed all of the setup steps, but was still encountering the ping timeout issue at reboot. I then ran the script http://pastebin.ubuntu.com/25894592/ you provided and am no longer hitting the issue. Was the script supposed to fix the issue? Please let me know. Thank you! I'm actively working into this, will provide better feedback soon. The script is just a workaround for now, so people can shut down properly, if they are facing this. Despite what userland does, the kernel will always potentially hang with iscsi sessions left opened during shutdown. If, after following the setup steps, you still faced the issue, its possible that your shutdown systemd unit ordering is wrong (your mount points are being unmounted before they are released). I'm working in the kernel issue, so, it shall cover all the userland-created situations. Basically the block device enqueues the last request (a SYNC scsi command coming from sd_shutdown) for every scsi device there is on the system. Unfortunately, since the OS is shutting down, in between the block request and its execution, we have userland (systemd) killing iscsid, without proper logout, and/or removing the network. What happens next is that the mid layer (SCSI) tries to deliver the request through the transport layer (iscsi_tcp_sw) but it fails since the transport layer checks the session status and finds out that the session is not in LOGIN state. The default behaviour of the transport layer (iscsi_tcp_sw) in such situation is to tell the mid-layer to keep resetting the request timeout timer while it tries to recover (something that will never happen because the network is gone). Changing that default behavior to state that the scsi command was NOT handled by the transport layer (iscsi_tcp_sw) implies in making the scsi timeout function to try to "abort" the scsi command, which also creates other commands that will timeout because of the transport layer. Best scenario so far was to change BLK_EH_NOT_HANDLED for BLK_EH_HANDLED in the scsi_times_out function and make the kernel to be able to shutdown. By doing that, I'm confirming to block device something that DID NOT happen, meaning that the command never left the transport layer. This might be ONE of possible ways to fix this: I can mark in the transport layer that I have timed-out DURING the shutdown procedure, cancelling all the block device requests without having to invoke the scsi error handling mechanism, generating more traffic in transport layer (what would also cause more timeouts, causing a loop in the problematic sequence). Anyway, I'll get back to this next week and hopefully identify best course of action. Then I'll propose Canonical kernel-team a SRU based on the upstream patch. For now this case is on hold for upstream discussion/decision. That's awesome sir, thank you for your diligence. I'll propose the cherry-pick as SRU for Ubuntu kernels as soon as it is merged. Changed open-iscsi to opinion since I choose to fix the kernel instead of fixing Userland. No matter what you do in userland, the kernel had space for freezing and hanging in different scenarios depending on how userland disconnected the transport layer. I kept the "linux" source package as being affected and will SRU it through Ubuntu Kernel Team. I have just submitted the SRU proposal to kernel team mailing list. I'll wait for the SRU to be made and this public bug to be marked as Fix Committed before verifying the fix again for the final release. PID: 1 TASK: ffff8801a69b8000 CPU: 1 COMMAND: "systemd-shutdow"
the session state to be logged in again. to be queued, allowing upper logic to fail faster. Waiting to be Fix Committed there. A soon as it is released to -proposed I'll verify it and provide feedback so it can be Fix Released. I apologize for my ignorance, but now that tall these check ins have occurred, how do I know when an installable package has been built and is available in the various repos? And thank you @inaddy for the diligence getting this one resolved. When the new kernel package is built, it will be placed into -proposed for each of the Ubuntu versions and you will be able to test the kernel and provide feedback here. Since I was the one that fixed it, I'll verify each of the kernels to make sure it fixed the issue. After verification, and at least 7 days in -proposed, the packages shall be moved to -updates. BTW, kernel team usually updates all affecting cases with the version that was built that address this issue (so you know what to text in -proposed). Thanks, and will notifications appear here in the bug during these stages? Yep, soon kernel team will advise (here) about this patch been released in a specific kernel version that is in -proposed and will call out for testing/verification. I'll give all feedback here also and will mark, if appropriate, case as "verification-done" so new kernel is marked as solving this issue. Thanks for the feedback. Working in verification. I'm verifying for trusty and its taking sometime because looks like system still hangs on shutdown. I have generated a kdump (from a watchdog timer) in the exact moment trusty is hanging on shutdown to see why BUT crash can't handle a kdump from this new kernel and I still don't know why. Testing latest crash tool to see if its because of recent meltdown/spectre patches or something like it. 1) It was not backported fully, missing the debug message at its bottom. That led me to initially think, when debugging, that the patch hasn't been included at all. Later I could check kernel tree and saw the it was manually merged, missing that debug message part. It should be "or shutdown" there, together. The iscsi transport layer, did not queue the other commands, after the first one timed out, but instead of warning the upper layer, it proceeded with a "device reset", causing the "relogin" logic to be stuck since the transport layer was already gone. PID: 5980 TASK: ffff880057e19800 CPU: 0 COMMAND: "halt"